The Endo Blog: Cracked Tooth? This patient came in today complaining of pain on #31. 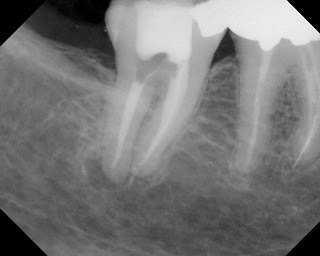 I went through my typical diagnostics and diagnosed the tooth as: partially necrotic pulp with phoenix abscess. The patient elected to go ahead with endodontic treatment today, since she is leaving town tomorrow morning. 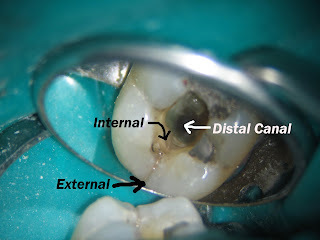 Once I opened up the tooth, I realized that there was a crack on the distal of the tooth. I proceeded with the access and removed all the distal amalgam to get a good look of the crack. 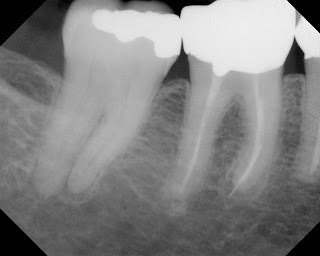 I wanted to find out if the crack was just in the surface of the enamel or if it went all the way through the dentin. 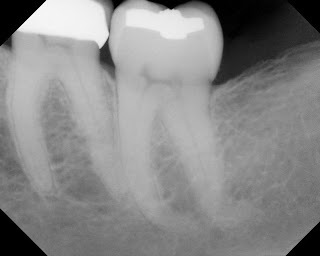 I found some purulence in the distal canal and bleeding in the mesial canals (confirming my diagnosis of partially necrotic). Once I got the access opened up, I could see that the crack ran down along the distal wall of the pulpal chamber. When I find cracks like this, I think that it changes the long term prognosis of the tooth. We all know that the research supports the survival rate of endodontically treated teeth (when properly restored) at very high levels (90+%). A crack in the tooth is a factor that will likely decrease that long term survival rate. However, I have found that even in a situation like this, when given the options, many patients still want to try and save their tooth. 1. Complete the RCT, restore, and recall. I explain the decreased prognosis. There is really no evidence/research (I am aware of) that would tell them how much a crack in the tooth will change the long term prognosis. 2. Extract the tooth. Replacement options are discussed. In this case, with a full complement of teeth, an implant would be the only practical replacement option. 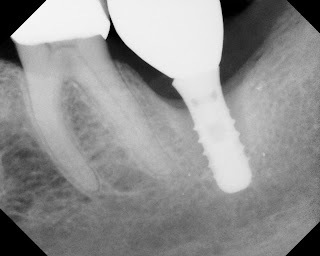 In this particular case, the patient decided that she did not want to extract the tooth. With good informed consent we completed the case, reduced the occlusion & temporized the tooth. She will return to her G.P. for build-up & crown. You may see that I removed a little extra gutta percha from the distal canal, to allow the bonded restoration to seal off the distal a little better. Here is how the final film turned out. We will recall her in 6 months to re-evaluate the distal lesion. I really feel that the key to this type of treatment is informed consent. When presented the options & prognosis, some patients will elect to extract and move on. However, most patients want to try and save their natural tooth. Endodontics can help them retain their natural teeth for many years. Here is another case where a cracked tooth was found and it was recommended that she extract the tooth and have an implant placed. The patient followed the recommendation and had tooth extracted, bone grafting, and an implant placed by a specialist. 4 years later, she returned for re-eavluation. The implant was loose, probed to the apex, and there was purulence. You have to wonder if it wouldn't have been better to have tried to save the tooth originally. 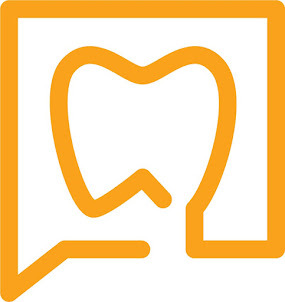 I can't guarantee that the tooth would have lasted with endodontic treatment, but it is an option that shouldn't be left out of the treatment planning process. The reason that this implant failed is most probably due to the fact it was to small a diameter for such a large crown (poor crown-root ratio) and occlusal trauma. Since there is no previous xray of the implant after placement or before this one, it would be hard to tell how fast the bone disappeared or if it was integrated at all. Better restorative and surgical treatment planning was required for this case to be successful long term. Hi Jason,I am really glad I found your blog. Thank you for sharing your wealth of experience and wonderful photos with us.I have learnt alot from reading your posts and looking at the pictures.Hopefully this will help me to able to better manage and treat patients. Many thanks and keep up the good work!